Hello everyone, let's talk about OAM (Operation, Administration, and Maintenance/Management. Based on wikipedia.org. The definition from OAM is the processes, activities, tools, standards etc. involved with operating, administering, managing and maintaining any system. There are many variant of OAM, but in this topic, let's talk about Y 1731 or naming IEEE 802.1ag. 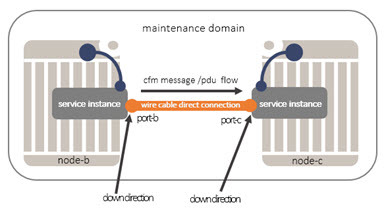 Or Ethernet Connectivity Fault Management (Eth-CFM). 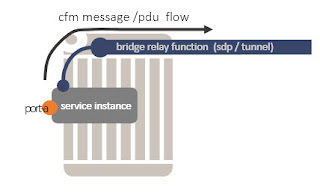 Eth-CFM is an end to end OAM that can across multiple domains to monitor service instance's health. 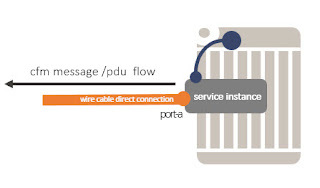 It's connectivity checking that uses Ethernet frames to validate services instance's health. In Telecommunication, we can see the topology below. There are many domain and each domain has different administration to manage. The MEP has a direction up and down, each indicate the direction cfm packet will be generated. 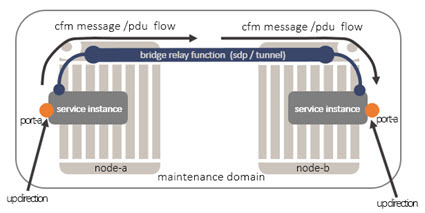 - The up direction means if the cfm packet generated, that packet will be sent from MEP to bridge relay function (in Alu case means, packet will be sent over sdp/tunnel). The simple topology when we use MEP up and down direction is like below. in Alcatel-lucent ther is option bridging-identifier to set up the MA ID, then the id similiar with the service instance that we want to implement eth-cfm. 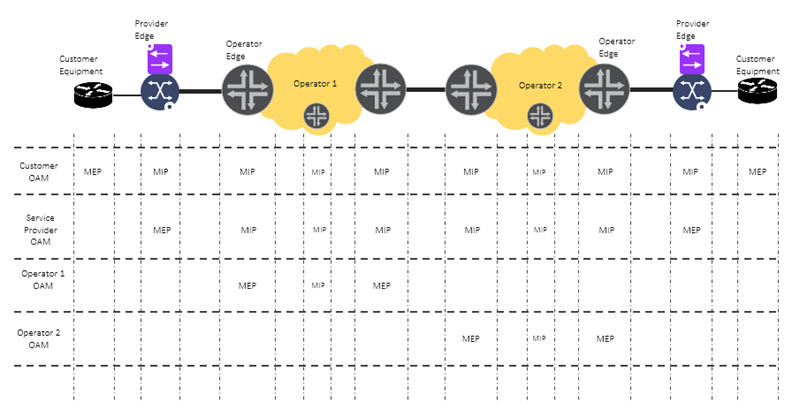 Continuity Check Message (CCM), is a multicast frame that is generated by MEP and multicast to other remote MEP in the same MA. This message no need reply message. To identify fault, remote MEP must be receive CCM message and where they come from. CCM still using multicast address destination. Loopback Repply Message (LBR), a message that generated by remote MEP/MIP when remote MEP/MIP receive LBM. association 1 format string name "ma1"
The output from the command is like below, Information how much ccm message that sent and received. output from the command, there is maintenance domain index (md-index), maintenance association index (ma-index), ccm interval (int), bridge-id (the id from vpls instance that want to monitor), MEPS, num of mep index that is oam use. 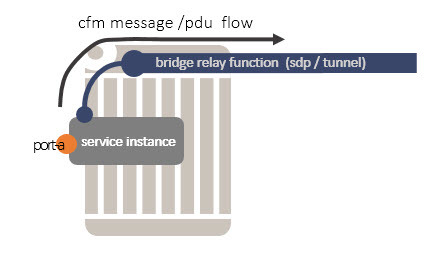 When you want to test the connectivity, there are several test you can do with eth-cfm. - optional parameter like size, interval, send-count, time out. 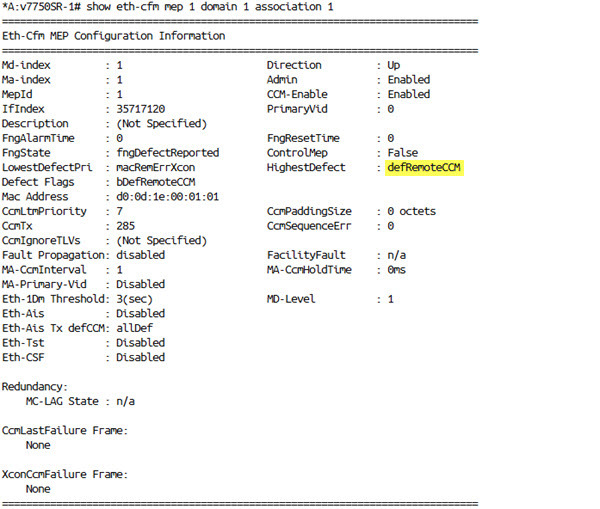 the output from eth-cfm linktrace. Egress Mac is targeted mac on remote mep, and index 1 is originating MEP index. Your blog has great content :)!! Rocket casino ICOs information like ICO Pulse decide the way to solve this problem is creation of how platform, Where set up with their ideas experts and investors can interact with each other and with this whole team which can build an idea and we believe that this platform improve situation on the market and introduce lots of one or more project to Blockchain community.